This past year has brought me the pleasure of seeing many of you at the annual meetings of ASIATOX, SOT, JSOT, and EUROTOX. I enjoyed hearing about your activities and working with ICT and CTDC hosts on our future IUTOX congresses in Belgrade, Hawaii, Melaka and Maastricht. 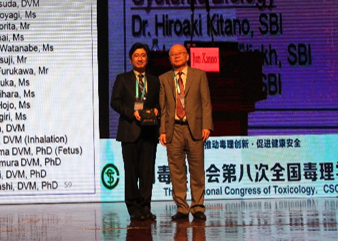 A highlight of the year was being invited by the Chinese Society of Toxicology (CSOT) to deliver a keynote address, Percellome Toxicogenomics for the Mechanistic Prediction of Chemical Toxicity, at their 8th National Congress of Toxicology in Jinan. The meeting was well attended and as always, their hospitality was ever gracious. As 2017 is winding down, we look ahead to a very active year for IUTOX in 2018, which will serve as the foundation for the 2019–2022 term. We will be calling on you as our partners to meet our goals at the General Assembly to elect another excellent Executive Committee and to select the CTDC12 and ICTXVII venue hosts. These efforts are key to the future of IUTOX and we thank you in advance for your interest and commitment to our community. Please note: Bylaws adopted in 2016 state, “The location of the ICT meetings should rotate among geographic regions, i.e., Africa/Europe; North and South America; and Asia/Australia.” ICT meeting locations include Montreal (2007), Barcelona (2010), Seoul (2013), Merida (2016), Honolulu (2019), Maastricht (2022). 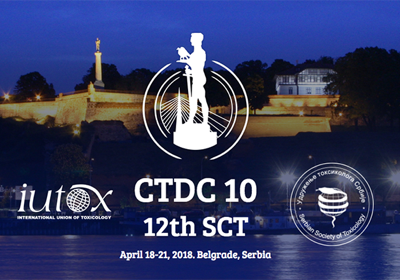 Join us in Belgrade, April 18–21, 2018 for CTDC10, hosted by the Serbian Society of Toxicology. The planning committee, led by Vesna Matovic, is working tirelessly to host an engaging meeting marked by excellent science. Submit Symposia and Continuing Education proposals for the 15th IUTOX International Congress of Toxicology (ICTXV) by December 31, 2017. You will not want to miss this meeting in the welcoming Aloha state of Hawaii! SOT committees are planning this one-of-a-kind meeting in a beautiful venue that can be enjoyed and appreciated by congress-goers and friends and families alike. Contribute to one of the three newsletter issues IUTOX publishes each year. We want to hear about your society’s activities and achievements, the successes of your scientists, news of travel awards, and any other information you find relevant to share with our international scientific community. Follow us on Twitter and Like us on Facebook! IUTOX has joined the age of social media and we want to hear from you! If you are a member society leader, please pay your IUTOX dues in a timely manner when you receive your invoice in January. Your ongoing support of IUTOX is critical to our operations and we thank you in advance for your continuing dedication to IUTOX. If you are living in a country that isn’t yet represented in IUTOX, consider taking the steps to either form a society or to encourage your toxicology society to join. Visit our website for membership information. If you’re part of industry or any entity in the position to make a financial contribution to IUTOX, please contact the secretariat for a list of funding ideas! Share this newsletter with your colleagues and the professional societies to which you belong to help increase our visibility and make new connections. Visit the IUTOX booth at the SOT Annual Meeting being held in San Antonio, Texas from March 11–15, 2018. We are happy to distribute your member materials at this meeting. Watch for travel award announcements on the IUTOX website and please share the information with junior and senior scientists interested in attending international toxicology meetings. In closing, I wish all of you well for the coming year and hope that 2018 brings you great happiness, excellent health, and career success. Happy New Year! As part of our efforts to reach out to scientists across the globe and share news and opportunities with our membership, IUTOX is ramping up its web and social media presence. You may have already noticed our new website which features a clean look and a format that is easier to navigate. We are also happy to announce that IUTOX now has both a twitter account and a Facebook page. These platforms will help us increase our audiences and keep our members and colleagues up-to-date on IUTOX activities and opportunities from all of our sister societies. Please help increase our followers by following us on Twitter and Facebook and encouraging your network to follow us as well! These social media activities have been spearheaded by a new IUTOX Communication Committee advisor, Dr. Patrick Allard, who joins us after two years of service on SOT's Education Committee. 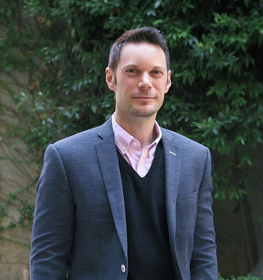 Patrick Allard is an assistant professor in the Institute for Society & Genetics at UCLA. He received his BSc from University of Toulouse, France and his MSc in Biology of Aging from University of Paris 5. He then completed his PhD degree in Biology from the University of McGill, Canada, followed by a postdoctoral fellowship in the Department of Genetics at Harvard Medical School. Dr. Allard’s work resides at the intersection of genetics, epigenetics, developmental biology, and environmental health. His research on the effect of environmental exposures on reproduction has been published in several high profile journals including PNAS, PLOS Genetics, and Environmental Health Perspectives. Dr. Allard has received multiple awards and grants including most notably an NIH Pathway to Independence Award, a Burroughs Wellcome Innovations in Regulatory Science Award, and a Templeton Foundation grant. He was also named Global Toxicology Scholar by the Society of Toxicology in 2011 and 2014. Some 230 representatives of ICSU’s global membership of scientific academies and unions representing 55 countries gathered in Taipei on October 23 and 24 for the tri-annual 32nd General Assembly. 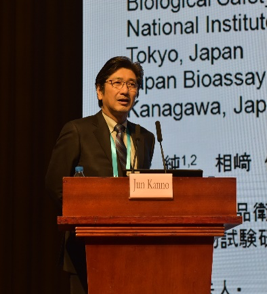 At Jun Kanno’s invitation, Dr. Jaw-Jou Kang, President of the Toxicology Society of Taiwan (TSTA), attended the Congress, which allowed IUTOX to be well represented at this important meeting. A merger between the International Council of Science (ICSU) and the International Social Science Council (ISSC) has been a topic of discussion for several years and was finally put to a vote in Taipei. The proposal passed overwhelmingly forming a new group called the International Science Council. IUTOX has had a long and productive relationship with ICSU for over a decade having been the recipient of three grants for risk assessment training and being represented on the CODATA and World Data Systems committees. IUTOX leadership looks forward to continuing its work with the newly formed Council to keep contributing to this key international scientific body. For more information about the terms of the merger, please see the explanation below. Learn more about the how and the what’s next of the historic vote in Taipei on October 26, 2017 to create the International Science Council by merging the world’s leading bodies representing the natural and social sciences. Q: What were the members of ICSU and ISSC doing in Taipei? From October 25–26, members of the International Council for Science (ICSU) and the International Social Science Council (ISSC) gathered for a Joint Meeting to vote on the proposed merger of the two organizations. Over the two days of intense discussions, members wrangled over and debated a number of contentious issues, notably on membership categories and voting procedures. At the end of the second day, members voted overwhelmingly (ICSU 97.6%, ISSC 90%) to merge and form the International Science Council in 2018. Q: What was voted on by the members at the Joint Meeting of ICSU and ISSC? For more information on the background to these decisions, please consult this link. Q: What were the key points of debate? On the first day the high-level strategy and proposal to mandate the new governing board to develop a new dues structure were unanimously approved. There was a more prolonged debate on membership categories and voting, which was extended into the second day. Q: Why was that a sticking point? In cases where there are several members in one country, or region, there was debate on whether a principle of “one member, one vote” should apply and whether different principles should apply for scientific, governance and financial issues. Q: So how will the new voting system work? These 3 categories were approved by a broad consensus. Members also agreed on a differentiated system of voting that allows for three types of procedure. For scientific matters, each member will get one vote. For elections and procedural matters, each member will get one vote, except when there are several members from the same place, in which case they should agree among themselves or, in cases where agreement can’t be reached, they will each be given a proportion of the vote. Furthermore, it was agreed that in some cases the General Assembly can agree exceptions. Given the inherent challenges of defining regions, the GA was empowered by the Membership to make the final decision on a case by case basis on the addition of any new member. Each Member Union or Association will have a weighted vote equal to the total number of country votes divided by the total number of member unions and associations, within the total membership base. Members highlighted the ambition of the new strategy, and stressed that to meet that ambition would require a significant change in new sources of external funding. Many also highlighted the importance of dedicating increased resources to outreach and communications. The vote on Thursday paves the way for a legal implementation phase to establish the new organization. Members will be asked to endorse the merger by electronic vote in the second quarter of 2018. The Founding General Assembly will take place in France, in the second half of 2018 and will include an International Science Summit. 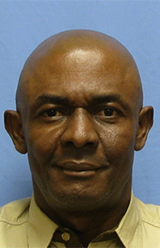 IUTOX thanks Dr. Orish Ebere Orisakwe for serving as our IUTOX Notable in this issue! Orisakwe: Risk Assessment, Metalotoxicology, Epigenetics. Orisakwe: Toxicology is severely underrepresented in Sub Sahara Africa including Nigeria. Orisakwe: Less than 1% of universities offer toxicology course work in Nigeria. Even where toxicology course work is offered, the content is not optimal due to inadequate exposure of the resource persons/mentors. Orisakwe: After winning the maiden Global Senior Scholar Exchange Program Award in 2012 and becoming a Fellow of ATS, I was challenged to work more for the growth of toxicology in the Africa. I became the first President of West African Society of Toxicology WASOT from 2012 to 2017. We have successfully held annual scientific conferences where some SOT mentors have participated as speakers. These interactions have created collaborations. With the help of some of these mentors from Europe and the US, I have been able to mount a graduate (MSc and PhD) program in Toxicology as a stand-alone discipline in the University of Port Harcourt, Nigeria. The first set of the students have since graduated and the second set will be defending their MSc theses in the near future. These students have coauthored over ten articles with me. Meanwhile I am still making efforts to replicate the same program at the University of Buea, Cameroon. Orisakwe: To young African toxicologists, my advice has been for them to remain resolute and resilient in the face of challenges and to work with stoicism of pioneers. Orisakwe: Prior to 2005, when I won the SOT/AstraZeneca/SOT Endowment/IUTOX Travel Award to attend the SOT Meeting in New Orleans, virtually everything I knew about SOT was by correspondence. That particular opportunity helped me to see and interact with several people especially members of African Society for Toxicological Sciences, African Education Initiative and Toxicologists of African Origin. That relationship has lasted till date and together we have organised several Toxicology conferences in Africa and started Cameroon Society for Toxicological Sciences where I serve as a mentor since 2006. My interaction with SOT courtesy of that 2005 outing has created networks which have been of immense benefits to my lab and my students. The conference was attended by about 80 young scientists representing 32 countries and all five TWAS regional offices. 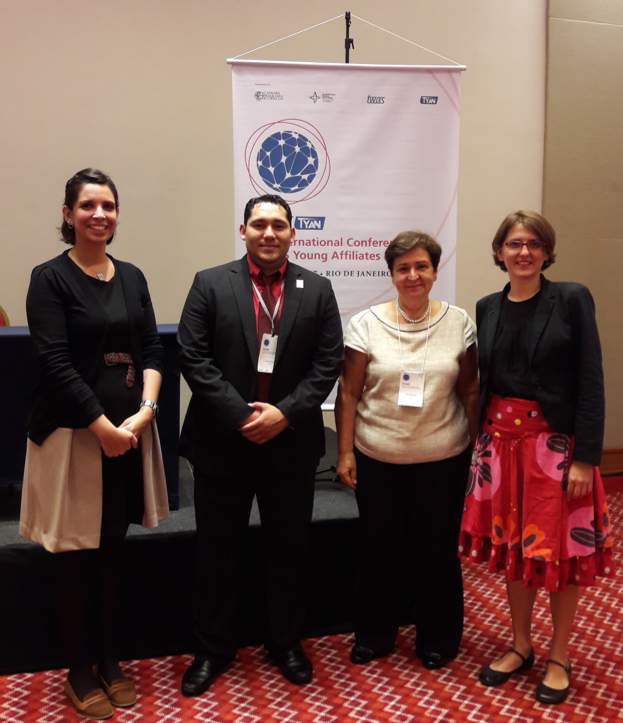 The meeting was organized in association with the Brazilian Academy of Sciences (BAS) and included 55 presentations by the TWAS Young Affiliates and a session with five presenters from the Brazilian Academy of Science Young Affiliates. This last session addressed Top Science with Low Funding, which addressed how it’s possible for a good scientific idea to be developed with limited resources. The event featured high-level speakers including Yin Li, TYAN Chair; Vivaldo Moura, TWAS-ROLAC; Manuel Limonta, ICSU ROLAC Director; and Max Paoli TWAS-Italy Office. The keynote lecture of the conference was Molecular Portrait of the Human Genome delivered by Sergio DJ Pena, Professor at the Universidade Federal de Minas Gerais. The Meeting was closed with an address from Prof. Luis Davidovich, BAS President, about Science, Policy and Governance: Inventing the Future and Addressing the Challenges for Science in the Third Millennium. IUTOX was invited to participate and was represented at the meeting by Prof. Silvia Barros, IUTOX Director. She participated as an invited speaker to introduce IUTOX to this new audience and addressed how IUTOX can partner with the TWAS Young Affiliate Network. IUTOX leadership thanks the organizers for the opportunity to share its goals and objectives and to introduce IUTOX programming to this select group. 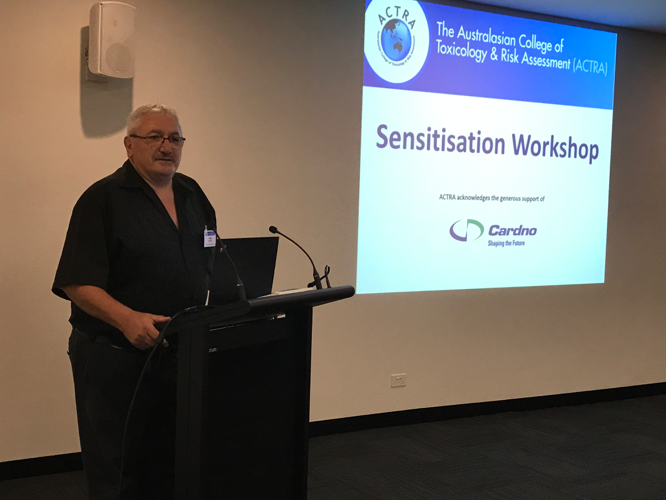 ACTRA organised a training day on sensitizers, which took place on Friday the 2nd of June in Melbourne. The venue was generously provided by Cardno. The day began with informative presentations from Professor Brian Priestly (Monash University & Director, ACHHRA) and Mr. John Frangos (CDM Smith) on the theory of the toxicology and risk management of sensitisers. A delicious lunch and fantastic networking opportunity was followed by an afternoon of case studies. The first, jointly run by Catherine Oh (Accord) and Professor Priestly had everyone put on different hats (regulatory, industry, or community) to explore how to deal with a sensitisation claim from an individual for an ingredient commonly present in a range of cosmetics, methylisothiazolinone. The second case study, run by Dr. Roger Drew (ToxConsult Pty Ltd) focused on exploring a range of data for decision making regarding lycopodium powder. It reminded attendees that information on Safety Data Sheets cannot always be relied upon, and through targeted reading of published articles allowed them to draw conclusions regarding the sensitisation potential of lycopodium. Overall, the majority of attendees seemed to enjoy the hands-on workshop format based on feedback received on the day. The concept was largely driven forward by Catherine Oh, who did a fantastic job in organising the event program. Based on the feedback received, ACTRA will aim to provide members and others interested with more hands-on type events in the future. 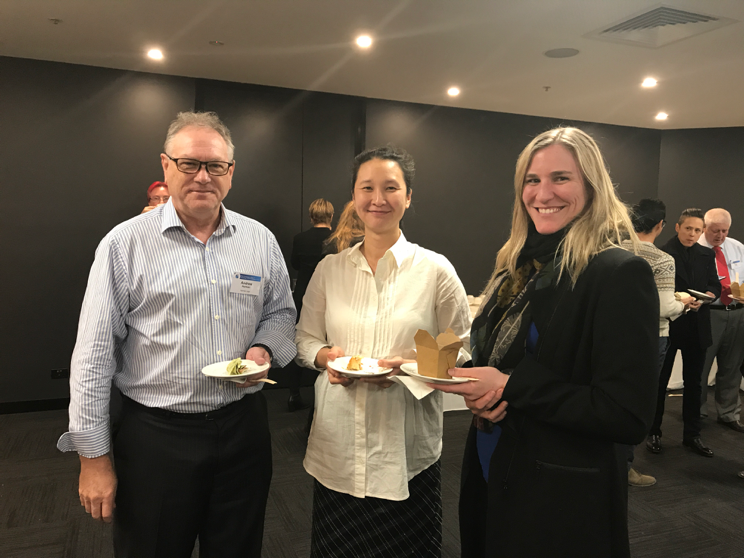 The Australasian College of Toxicology and Risk Assessment held the 10th Annual Scientific Meeting and Continuing Education Day at Rydges Capital Hill, Canberra from 27–29 September 2017. ACTRA’s Annual Scientific Meeting aims to advance the study and application of toxicology and health risk assessment as professional scientific disciplines by offering the latest research, innovations, case studies and applications in toxicology and risk assessment. Dr. Les Davies, ex APVMA and chair of the local organising committee (LOC) and the members of the LOC did a sterling job in organising the ASM. The theme for the meeting was “Risk Assessment of Novel Technologies.” The ASM followed a day of Continuing Education (CE) courses on New Approaches/Methodologies in Risk Assessment on Wednesday 27 September. The ASM keynote address was delivered by Dr. Harvey Glick (Monsanto). There were seven other invited speakers covering a range of topics relating to toxicology and health risk assessment. There were also some thirteen submitted papers covering aspects of risk assessment, toxicology, regulatory activities, and ecotoxicology, as well as the winner of the student prize. Overall it was a very successful and thought-provoking meeting! There were riveting presentations on the risks and benefits of new biotechnology techniques (e.g. RNA for gene silencing, precision breeding technologies, gene drives), talks dealing with various general aspects of risk assessment (e.g. short-term tolerable daily intakes, vapour risk, recreational soil exposure), presentations on nanotoxicology and nanosafety, as well as talks presenting new information for risk assessment of per- and poly-fluorinated alkylated substances (PFAS). We had 100 delegates attend the ASM and 62 the CE day. These numbers are the best we have had for an ASM in the brief history of ACTRA and is a great way to celebrate our 10th ASM. We look forward to welcoming everyone to the next ASM, planned for end of September/beginning of October 2018 in Perth, Western Australia. sponsored sessions (Pharma-oriented), one affiliated society sponsored session (ESTIV), five CECs, three inter-disciplinary keynote lectures, three featured lectures, HESI Lecture, EUROTOX-SOT Debate, BHMF Lecture, four poster sessions (650 posters/e-posters) and around 200 speakers. The social program included the welcome cocktail (Sunday), a sponsor’s appreciation dinner (Monday), and the Gala dinner at Schloss Hof (Tuesday). 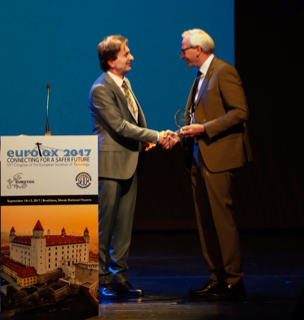 EUROTOX President, Prof. Mumtaz Iscan, presented the 2018 Merit Award to Prof. Bas Blaauboer in recognition of his distinguished career in European toxicology. The opening ceremony also included a performance by the Slovak artistic ensemble Lúčnica. Photos of the congress and a video of the opening ceremony can be viewed in the congress website. The neurotoxicological landscape is steadily changing. In the early years, neurotoxicological research focused strongly on clearly distinct disciplines, covering a spectrum from neuro-epidemiology, through neuropathology and in vivo neurobehavioral research to mechanism-based in vitro neurotoxicological research. Within each of these disciplines, there has been a clear need and development towards integration of different endpoints, which has resulted in e.g., neurobehavioral test batteries or in vitro integrated test strategies. However, to truly understand the neurotoxic effects of a particular exposure it is simply not sufficient to only integrate several endpoints within a particular discipline. Rather, a full integration of the different disciplines within neurotoxicology is required to connect the cellular and molecular mechanism of a neurotoxicant to an adverse outcome in an in vivo experiment, or ultimately in the human population. This view was perfectly reflected in the theme of the 16th biennial meeting International Neurotoxicology Association (INA): From molecular mechanisms to functional impact: Developing integrated analysis in neurotoxicology. For the first time in its almost 30 years of history, the INA met together with the NeuroToxicity Society (NTS) in South America. The meeting was held in beautiful Florianopolis, Brazil, from May 20–23. With close to 200 attendees from around the globe, the organizing committee consisting of Drs. Gustavo Ferreira (Universidade Federal do Rio de Janeiro, Rio de Janeiro, Brazil), Alexandra Latini (Universidade Federal de Santa Catarina, Florianópolis, SC, Brazil), Maria-Trinidad Herrero (University of Murcia, Spain) and Edward D. Levin (Duke University, Durham, NC, USA) can look back at a successful meeting! This well-attended meeting hosted over 90 talks, including the INA 2017 Jacob Hooisma Lecture given on Saturday by Dr. J. Timothy Greenamyre (University of Pittsburgh, PA, USA) on Parkinson’s disease: At the intersection of genes and environment. In the successive days, parallel sessions covered a broad range of topics including sensory toxicity, neuroinflammation, neurodegeneration and Parkinson’s disease, neuroprotection and therapeutic drugs, antibiotics and viruses in neurological diseases, neurotoxicology of abused drugs and New Psychoactive Substances, mitochondrial mechanisms, metabolic disorders, autism, impacts of early life stress, and integrated testing strategies. In addition to the oral sessions, more than 80 posters were presented during the poster session on Sunday. A large fraction of these posters were presented by scientists from Brazil, including a considerable number of young scientists who vied to win one of the six Best Poster Presentation awards. Candidates were judged by Drs. Ed Levin, Miki Aschner, and Monica Bastos and the winners were announced at the awards dinner on Tuesday and received their award from Maria-Trinidad Herrero (past president NTS), Monica Bastos (past president Brazilian Society of Toxicology) and Remco Westerink (president INA). Congratulation to Beatriz Thomasi, Hercules Freitas, Debora da Luz Scheffer, Igor Ferraz da Silva, Filipe de Araujo and Stella Junqueira on winning this award! Another event that was obviously dominated by our young scientists was the Joint Student Award Symposium on Monday afternoon. As the name already implies, the speakers in this symposium were young scientists who received one of the five travel awards. Candidates had been judged on the quality of their abstracts by Christoph van Thriel, Jean Harry, and Ed Levin. This year winners were Jenna Strickland (Michigan—USA), Anke Tukker (Utrecht, the Netherlands), Tanara Peres (NY—USA), Adel Jungling (Pec—Hungary) and Emmanuel Casanova Ortiz (Santiago— Chile), who unfortunately could not make it to the meeting. Winning one of these travel awards is of course great fun and an important recognition for the work performed, but for young scientists it is often also a financial necessity to be able to attend our meetings. We are therefore extremely grateful to the meeting sponsors that enabled us to generate these travel awards: Agilent/Seahorse, Alesco, American Society for Neurochemistry, Axion BioSystems, Axol Bioscience, Cellular Dynamics International, Conselho Nacional de Pesquisa e Desenvolvimento Tecnológico (CNPq), Coordenação de Aperfeiçoamento de Pessoal de Nível Superior (CAPES), Elsevier, International Society for Neurochemistry, Mimetas, National Institute for Environmental Health Sciences, and Springer Publishing Company. In addition to travel and best poster awards, there was one even more important award: The prestigious David Ray Award. Dr. David Ray of Nottingham was a former INA president and teacher of many PhD students. He regrettably passed away much too early in 2010. David was an outstanding neurotoxicologist and an active and enthusiastic INA member. When he died, INA lost a valuable promoter of neurotoxicology. 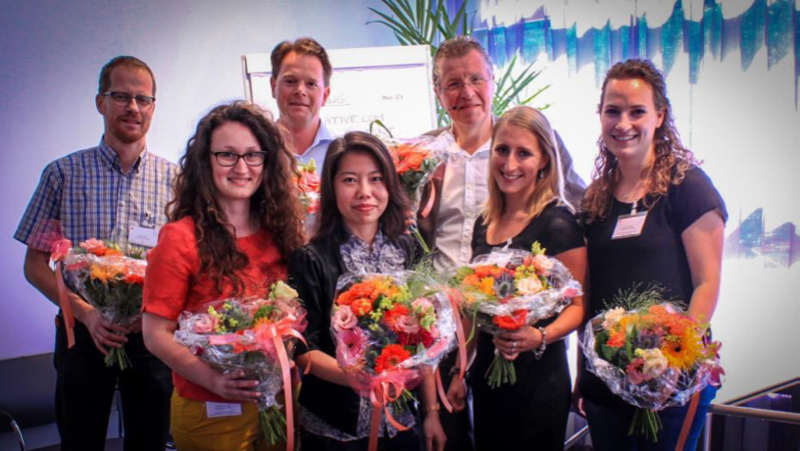 To keep the memory of David Ray alive, the David Ray Student Travel Award was inaugurated at the 25th anniversary of INA at INA-14 in The Netherlands (2013). This year’s finalists for the award were Jenna Strickland (Michigan—USA) and Anke Tukker (Utrecht, the Netherlands). They were selected based on their CVs and abstracts by the first-tier judges Drs. Ed Levin, Sandra Ceccatelli and Marcel Leist. Both students presented their work at the meeting and were evaluated by a second set of judges consisting of Drs. Will Boyes, Anna Price and Cristina Suñol. However, despite the abundance of judges, it was a tie. For the first time in its short history, the David Ray Award had to be split between both candidates as they both deserved to win this prominent award. Congratulations to both! The INA16 meeting in Florianopolis (Brazil) was a true success and we have already moved on to developing INA17. Local organizers Drs. Ellen Fritsche and Christoph van Thriel (past INA president 2013–2015) are already working vigorously with Dr. Remco Westerink (current INA president 2017–2019) to host the next INA meeting in 2019. The 17th Biennial Meeting of the International Neurotoxicology Association will take place in Dusseldorf (Germany). All dates and details can be found in due time on our website: www.neurotoxicology.org. The Yale School of Public Health is pleased to announce that Dr. Salmaan H. Inayat-Hussain of Petroliam Nasional Berhad (PETRONAS) in Malaysia has been selected by the J. William Fulbright Foreign Scholarship Board to be a visiting scholar in the United States under the Mutual Educational Exchange Act (Fulbright Program) sponsored by the Bureau of Educational and Cultural Affairs of the United States Department of State and the Malaysian–American Commission on Educational Exchange USA in the field of toxicology. Dr. Inayat-Hussain will conduct research on a systematic risk-based approach for managing reproductive toxicants in the petrochemical industry while at the Department of Environmental Health Sciences at the Yale School of Public Health in collaboration with Professor Vasilis Vasiliou, PhD, from August 2017 to February 2018. Dr. Inayat-Hussain is one of over 800 faculty and professionals worldwide who received Fulbright Scholar grants for advanced research and university lecturing in the United States for the 2017–18 academic year. Fulbright recipients are selected on the basis of academic and professional achievement as well as their record of service and demonstrated leadership in their respective fields. Dr. Inayat-Hussain, an American Board Certified Toxicologist (DABT) and EUROTOX Registered Toxicologist (ERT), has been a pioneer in toxicology at PETRONAS and in strategic planning of the Global Toxicology Department within the Group Health, Safety, Security & Environment Division. In 2015, he was appointed as the Group Technical Authority to provide technical leadership and drive best practices implementation in toxicology throughout PETRONAS. Prior to joining PETRONAS, he was a Professor of Toxicology and Dean of the Faculty of Health Sciences, Universiti Kebangsaan Malaysia. He was also a visiting professor at the Graduate School of Engineering at Kyoto University in Japan. He earned a PhD in toxicology from the MRC Toxicology Unit, University of Leicester, UK, and was elected as a Fellow of the Academy of Sciences Malaysia in 2012. 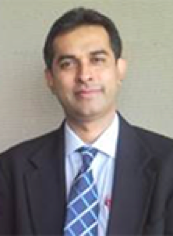 Dr Inayat-Hussain’s global involvement in toxicology is demonstrated by his leadership as a director of the International Union of Toxicology (IUTOX) Executive Committee and the chair of the IPIECA GHS Task Force. Furthermore, he is an expert panel member of the Joint FAO/WHO Meeting on Pesticide Residues. Currently, Dr. Inayat-Hussain is the associate editor for Food and Chemical Toxicology journal and editorial board member of several journals, including Human and Experimental Toxicology, Journal of Toxicological Sciences, Toxicology Methods and Mechanisms and Genes and Environment. Dr. Inayat-Hussain will conduct a project to systematically assess and prioritize chemicals used in petrochemical industries specifically with regards to reproductive health hazards. Databases from Yale School of Public Health and PETRONAS on chemicals used in fracking fluid and in petrochemical operations will be utilized for hazard classification and subsequently a priority setting will be performed using the new chemical risk assessment framework matrix, RISK21. The goal is to create a priority list of reproductive health toxicants that will help determine safer alternatives for sustainable chemical stewardship. This year, the Annual Meeting of the Netherlands Society of Toxicology was held on the 20th and 21st of June at the Kaap Doorn Conference Centre, Doorn, with theme “Translational Toxicology: From Molecule to Regulations.” The first day was the NVT-member day, which included the annual NVT business meeting, whereas the second day was the ‘young scientists’-day. Keynote lecture of Prof.dr. Peter J. Boogaard. 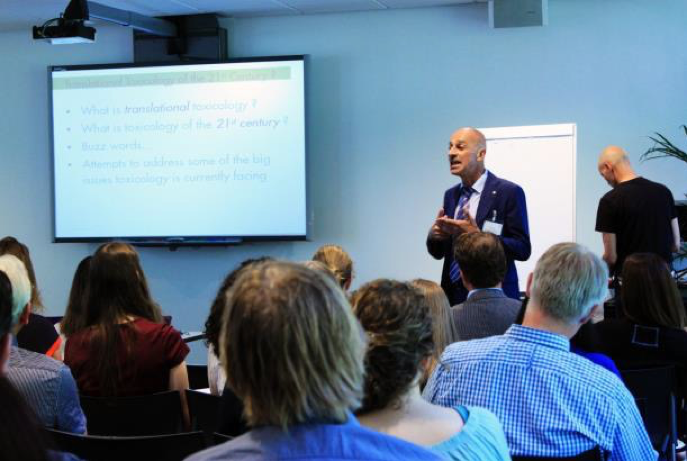 The first day of the NVT annual meeting was opened by the president of the Netherlands Society of Toxicology, Prof. dr. Flemming Cassee, The NVT-member day started with a lively and inspiring lecture from Prof. dr. Peter J. Boogaard, entitled “Translational Toxicology of the 21st century,” continued by parallel sessions of 4th year/senior PhD candidate presentations and “(Eco)toxicology and nanoparticles: from measurement to regulation”. A lively discussion followed: is nanotoxicology a hype? After lunch, two parallel sessions: Business meeting NVT and career pitching took place. Several speakers with different working background, for example academia, industry, and government institution, were invited to share their experiences with the audience in the career pitching session. Presentation of Prof.dr.ir. Ivonne Rietjens at the second day, for young researchers. During the NVT business meeting this year, a number of items were discussed (such as annual report of the board, Finances 2016, ERT re-registration process, reports of the different committees) including the switch of the chair and vice-chair of the board. The NVT-member day was then continued by another parallel session of “Panel Discussion: Translational Toxicology and Alternatives” and “Occupational Toxicology: It’s the Exposure, Stupid.” Then, various sections of the Society gave a short pitch and the day was completed with the award ceremony for the Joep van den Bercken prize 2017, IUTOX 2020 logo competition, the best 4th year/senior PhD presentation, and the best three abstracts of MSc students. After the reception and dinner, the first day ended with the evening (social) program, where participants joined in a pub-quiz with drinks and enjoyed music by DJ Marcel van Drunen, Mars Music. The chairman of the 2017 NVT meeting, Prof. dr. Henk van Loveren, initiated the second day of the meeting, which was the young scientists-day. It was then followed by a very intriguing talk by Prof. dr. ir. Ivonne Rietjens entitled “Using the wealth of toxicological data for human risk assessment.” A remarkable statement was that for nanotoxicology currently we cannot do without animal experiments. After the coffee break, five PhD students had the opportunity to give a 15-minute presentation on their topic and compete for the Speed Presentation prize. The young scientists’ day was then proceeded by three parallel workshops, including the session of three workshops on transferable skills development (visualizing your story and negotiation) and the 50 shades of scientific integrity. The participants really enjoyed the workshop with a lively discussion during the sessions. This was also mirrored by the evaluation with the overall rating of the workshops at 4.3 out of 5. The program was then continued by the speed presentation of five selected MSc students. The young scientists’ day ended with prize award for the speed presentations of PhD and MSc students and was concluded with a reception. On the 13th of April 2017, the section pharmaceutical toxicology of the NVT held its annual spring symposium. This year, the meeting was organized together with the CBG MEB and titled “Sense and nonsense of safety studies in animals.” As a special highlight, Jan Willem van der Laan was key in the meeting, celebrating his 40th anniversary in the field of (pharmaco) toxicology. After the chair of the section, Leon van Aerts, opened the meeting, Bert Leufkens, chair of the MEB, provided a word of welcome to the participants. The first speaker David Jones from the MHRA (UK) shared his vision on the drug development, through examples like TGN1412 (originally developed by TeGenero, currently TAB08 by TheraMab) and BIA 10-2474 (“the Bial trial” in Rennes). He explained Jan Willem and himself shared the vision that all models are wrong, though some might be useful. Further, the pharmacokinetics (PK) should be critically reviewed, with data available in multiple ascending dose (MAD) studies prior to the next dose escalation. Special attention should be given to the estimation of the initial dose in a first in human (FIH) clinical trial, and the subsequent dose escalation to a predefined maximum dose based on PK. A rigid adherence to science rather than guidelines should be the norm. Beatriz da Silva-Lima, previous chair of the SWP, currently with the NDA, followed as second speaker. She had many nice words for Jan Willem, praising him for his work and achievements. She provided an overview of the regulations and guidelines, mentioning that the focus should not be on ‘sense’ or ‘nonsense,’ rather common sense! With case examples and the presentation of potential alternative models, Beatriz's presentation was well aligned with Joseph deGeorge’s. As the other speaker had, Joe from MSD also shared compliments and nice stories about Jan Willem. In his presentation, he shared with the audience how the ICH S1 guideline was established and what the field looked like before. How the different authorities did not accept each other’s guidelines and companies had to redo carcinogenicity studies based upon the discrepancies. The presentation provided a good overview of what has been achieved since the establishment of ICH S1, as well as what has still not been achieved, such as the questionable sense of the two-year mouse carcinogenicity study (listed as optional in the ICH guideline). Bob van de Water, LUMC, dazzled the audience with his overview of alternative approaches. He showed that the combination of compounds with a similar structure and compounds with a similar mode of action can result in integrated testing strategies. He shared many ways how a chemical can lead from exposure to adversity, based on key events in the AOP framework using insulin analogues as an example. But there is something missing in his research and that is the local concentrations within the cell. Nynke Kramer highlighted that it is more than simply measuring the concentration in the medium. Compounds can have sorption to plastics, medium components and if they reach the cells, metabolism needs to be taken into account. Modelling (QIVIVE) can be used to estimate the toxicokinetics of a compound within an in vitro system. The approach is supported by the fact that modelled data is aligned with measured data when the sorption is taken into account. On April 6, 2017, the NVT risk assessment section, together with the section Toxicological Pathology, hosted the workshop “Adversity in safety studies: How to set a NOAEL?.” We were welcomed at the venue of AkzoNobel by Kim Doornebosch. Theo Vermeire, chair of the NVT risk assessment section, introduced the program and the speakers. This meeting addressed the contemporary view on “Adversity in animal studies” and its consequences for deriving a NOAEL. The reason for this meeting was the proposal by the Society of Toxicological Pathology (STP) to denote a test article effect as being “adverse” if it is harmful to the test animal resulting in impaired (organ) function/wellbeing of the test species. This was supported by the Society of Toxicological Pathology (STP) in one of their recent publications. To underline the actuality of this topic, the EFSA recently published a Guidance of Biological Relevance for which public consultation has been done (hyperlink). In the first part of the meeting, the STP position on “adversity” was highlighted and an alternative view on “adverse” was presented. In a concluding presentation a comparison was made of the potential consequences of the new concept of adversity on both the NOAEL and Bench Mark Dose approach. In the 2nd part of the meeting, the new concept of adversity has been applied in an interactive workshop in which the attendees discussed in small groups the setting of a NOAEL for a number of case studies. The first speaker, Eveline de Rijk (CRL), gave an introduction to the papers written by the American (STP) as well as European Society on Pathology (ESTP) on what is adverse in animal safety studies? The STP publication provides guidance on the declaration of adversity of an effect and how this is translated into a NOAEL. In addition, guidance is given on how to report and communicate a NOAEL and adversity of effects. The STP publication is a procedural publication based on historical issues and misinterpretations. There are many definitions of what is considered an adverse effect; statistical and biological differences are of importance, or effects on well-being, or highest level of exposure that does not lead to toxicity. An effect is related to test item? If yes: is the effect harmful? In the end there should be no difference in the conclusion on adversity in studies for pharmaceutical, biocides or industrial chemicals. This should be independent of the application of a substance. Next Frieke Kuper (TNO) presented a model that can be used to look at adversity in another way. In the current practice any negative impact on ‘good health’ is based on expert judgement. These experts generally perform evaluations per group of parameters and per expert (pathologist, toxicologist etc.). In the ‘other way’ model the data are interpreted at an individual animal level. Four studies have been performed with this model. Correlations and patterns are visualized. A principal component analysis has been performed on the dataset collected in a study. The model tries to identify for a 2D space in 26-dimensional space and calculates the best fit and at the same time tries to separate the animals as much as possible. In this way you can identify which parameters contribute the most to the effect. You also assess which animals stand out of the population. Keep a close eye on any outliers, they tell a lot also about variation in a population. In complex systems you can compare homeostasis with hills and valleys. It takes a lot of energy to reach another state (resistance up the hill); once you are over the hill there is high risk of transition/low resilience. The model helps to recognize recognition patterns. This benefits identification important parameters and group (population) responses. More research and evaluation is needed. The third speaker was Bas Bokkers (RIVM). Bas gave an overview of adversity of effects, consequences for deriving a point of departure. He started with presenting results of a personal small survey at RIVM he performed among his colleagues on how risk assessors identify NOAEL. He identified a number of different approaches. The benchmark dose (BMD) approach is a more sophisticated approach to derive a NOAEL. Using this analysis you can define a “small” effect size called the benchmark response (BMR). What is the acceptable additional risk for continuous data (individual level) and for quantal data (population level)? A pragmatic approach is to use a BMR of 5% for continuous and 10% for quantal data as a default. In the US a standard deviation approach is also used (to make sure you are outside the sampling error range). Drawback of this approach is that this highly depends on study and lab quality. In a recent study (Slob, 2016) a new theory is presented on effect size, involving meta-analysis on a lot of toxicological endpoints and compares severities between endpoints. 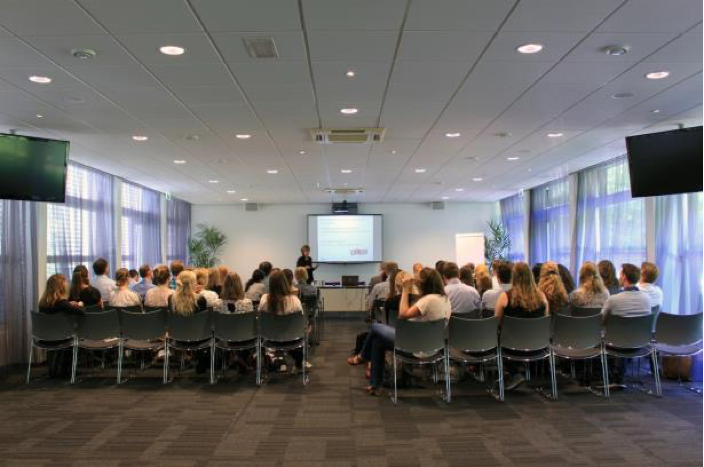 The last part of the afternoon Anja Slikkerveer and Liesbeth Heijink (Astellas Pharma) facilitated an interactive workshop on adversity cases (from the STP workshop and EMA workshop in 2016). Within this workshop the audience was divided in small groups to debate on a total of four cases. The questions were simple: what is the NOAEL? And what are key points supporting your assignment of the NOAEL? However, during the discussion it became clear that the studies give sufficient reason for debate. It was concluded that it is realistic that people disagree on a NOAEL for a study. It is more important to be transparent about the rationale behind determination of the NOAEL. Thanks to the contributors and the enthusiastic participants we look back on an interactive afternoonand good discussions. The Society of Toxicology (SOT) Global Senior Scholar Exchange Program (GSSEP) supports scientists from developing countries to work with SOT members in academia, government, or industry with the goal to help increase toxicology capacity in developing countries. While the direct benefits are tangible, the indirect benefits of spending time together at each other’s university are equally important in developing capacity and interest in toxicology. 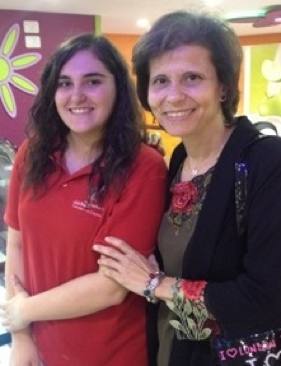 Dr. Sawalha (right) is with one of her students. Dr. Ansam Sawalha, one of the two 2017 GSSEP award recipients, participated in an exchange with Drs. Steven Gilbert, Dave Eaton, and Elaine Faustman of the University of Washington, Seattle, Washington. Dr. Sawalha is a Professor of pharmacology and toxicology at An-Najah National University, Nablus, Palestine, and founding director of the Palestinian Poison Control Center. In January 2017, Dr. Sawalha visited the Department of Environmental and Occupational Health Sciences at the University of Washington where she attended graduate courses, met with faculty and students, and collected syllabi and other information to help build the toxicology program at An-Najah University. She gave a lecture on toxicology in Palestine at a department-wide seminar and also initiated collaboration with Dr. Dave Kalman to evaluate lead levels in various children’s products available in Nablus. In March, she attended the SOT Annual Meeting and presented an abstract entitled “Analysis of Poisoning in Children Less than 6 Years Old Reported to the Poison Control Center in Palestine.” While in the United States, Dr. Sawalha also visited Dr. Serrine S. Lau, Professor and Dean at Wayne State University, along with other faculty members, including Dr. Terrence Monks. At Wayne State, she attended classes and discussed toxicology curricula and teaching approaches. 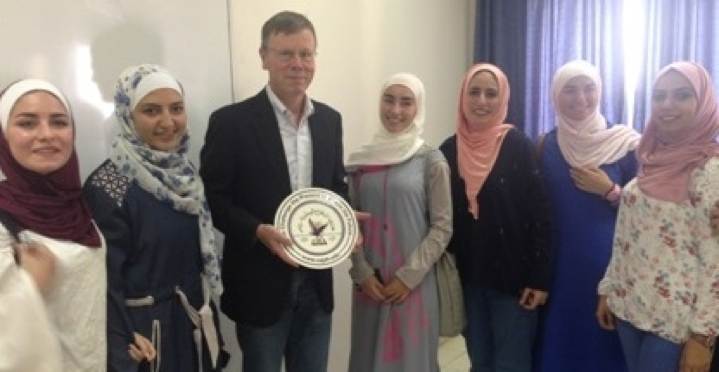 Dr. Gilbert receives acknowledgement for his presentations at An-Najah National University, Nablus. In October 2017, Dr. Steven Gilbert traveled to Nablus where he gave numerous lectures on the health effects of low dose lead exposures and basic toxicology principles. He also gave lectures on the problems related to the drugs used to treat Parkinson’s Disease and Deep Brain Stimulation as an alternative treatment strategy. He met with the Dean and various departmental faculty members to discuss the advantages and challenges of establishing a toxicology program and the possibilities of broader collaboration with the An-Najah School of Public Health as well as the School of Medicine. Faculty members and the students were particularly interested in Dr. Gilbert’s Milestones of Toxicology poster and book, A Small Dose of Toxicology, both of which have been translated into Arabic. Dr. Sawalha and her students were instrumental in the translation of both the Milestones poster and the book. Drs. Gilbert and Sawalha traveled to Ber Ziet University in Ramallah to meet with Dr. Rita Giacaman and two of her colleagues for discussions on collaboration to evaluate childhood lead exposure in Palestine, including the Gaza Strip. This collaborative project has several advantages. First, it would provide for the development of a map of lead contamination throughout the West Bank and Gaza and allow scarce resources to reduce lead exposure to be deployed rationally. Educational material on the health effects of lead would be developed in Arabic for use in Palestine as well as in other parts of the Arabic speaking work. Second, this project would foster collaboration between Ber Ziet University, An-Najah National University, and the University of Washington. This would further the collaboration between researchers and students from all institutions. The GSSEP provided an opportunity to develop stronger relationships and build expertise in an Arab-speaking country that has significant environmental and general health problems. The exchange was extremely fruitful. 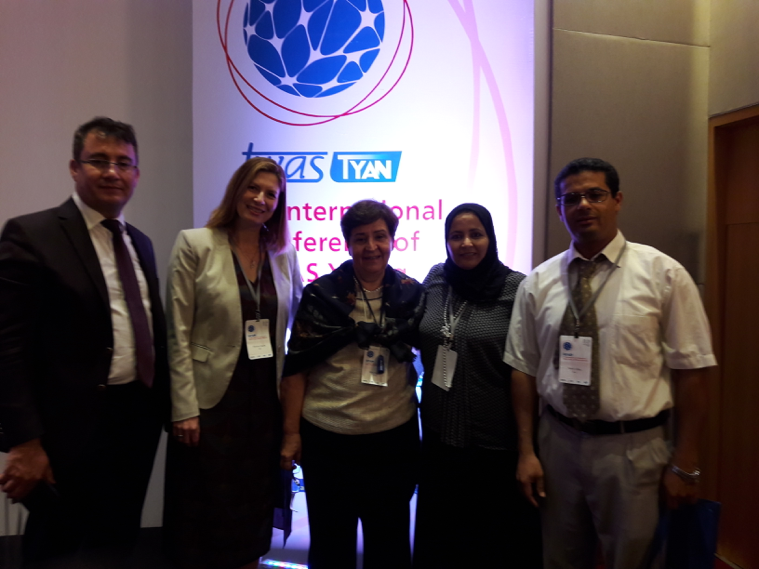 New research opportunities have been explored, along with strategies for developing a toxicology program in Palestine, including a Palestinian society of toxicology. Future student and/or faculty exchanges are a definite possibility. Despite the challenges of coordinating different academic calendars and teaching responsibilities, combating the distractions of jet lag, and addressing the challenges of Israeli travel restrictions for Palestinians and Americans traveling into and out of Palestine, the GSSEP Scholar exchange between Dr. Sawalha and the faculty at the University of Washington was professionally exciting and personally satisfying. Toxicology has a common global language and many of the problems and challenges of exposure to toxic compounds are found in all areas of the world. The SOT investment in the GSSEP is an important component in building awareness and expertise in developing countries. 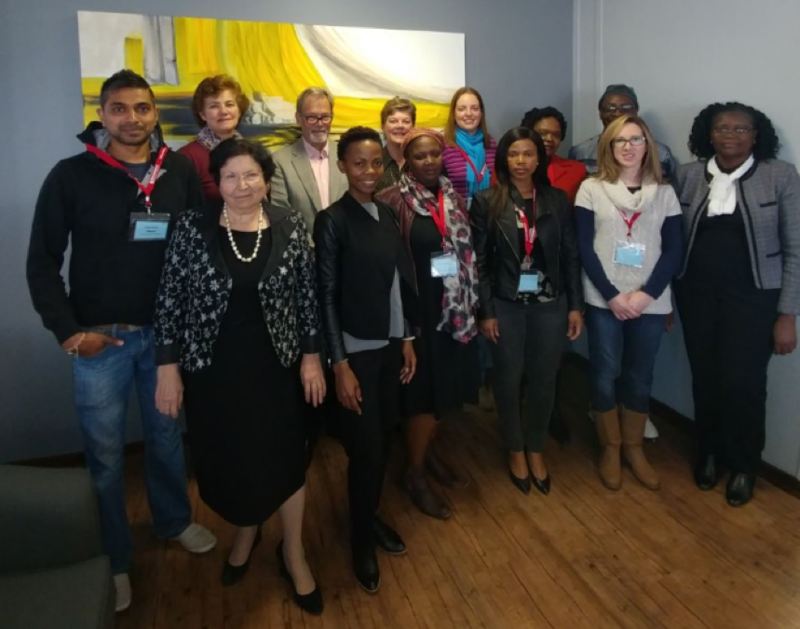 The Department of Pharmacology, University of Pretoria hosted the Basic and Advanced Toxicology Short Course during the July recess. This is the first course of its kind to be hosted in the country and on the continent. The credit bearing Basic and Advanced Toxicology short course is a preparatory exercise towards a new degree programme at the Master’s level, focusing on Health Risk Assessment and Toxicology, to be called the Master of Philosophy (MPhil). 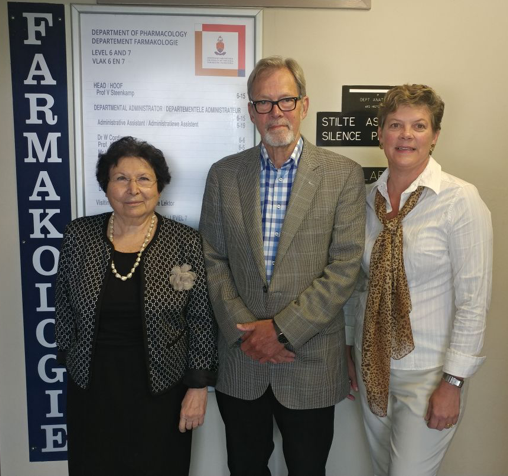 The presenters of the course included Professors Vanessa Steenkamp (Head of Department: Pharmacology), Mary Gulumian (Head of Division of Toxicology: NIOH) and Herman Autrup (Institute of Public Health, University of Aarhus, Denmark (Emeritus). This course has been a long awaited and needed course in the country. Toxicology seeks to identify, estimate, and control the benefits and adverse effects of chemicals in order to preserve human health and the environment from undesired effects. This field therefore occupies a key role in the complex scenario of protecting human health and the environment and to obtain an important function in the decision-making process where science has to interact with and occasionally confront, technical, political and societal visions. Delegates from the Department of Health; Department of Agriculture, Forestry and Fisheries; National Institute for Occupational Health, and the Lecturers. Module 1: Introduction to Toxicology was held from July 3–7, 2017. The module provided students who are seeking vocational training but lack formal undergraduate training in toxicology the opportunity to obtain extensive, basic theoretical knowledge in this field. Module 2: Advanced Toxicology: Mutagenesis and Carcinogenesis took place from July 10–14, 2017. This module familiarised participants with the mechanisms by which DNA damage causes genetic alterations and cancer and the cellular processes which protect human beings from the deleterious effects of DNA damaging. The presenters and delegates agree that this was a huge success. We envisage the full course to start next year and to produce 20 Masters students within the two-year period. In the Spotlight: The 10th World Congress: Where have we been and where are we going? Ebola struck hardest in three West African countries that had little scientific capacity to monitor or respond to the 2014–2016 outbreak. To better prepare health officials in Guinea, Liberia and Sierra Leone to deal with future infectious disease epidemics, Fogarty has issued a second round of four grants to help the countries develop research training plans through its Emerging Epidemic Virus Research Training for West African Countries with Widespread Transmission of Ebola program. In keeping with World Health Assembly Resolution 67.11 Public health impacts of exposure to mercury and mercury compounds: The role of WHO and ministries of public health in the imple­mentation of the Minamama Convention, WHO hosted series of events dedicated to health on 22 September. Nearly four years since the global community adopted the Minamata Conven­tion on Mercury, this global treaty that seeks to protect human health and the environment from the adverse effects of mercury entered into force on 18 August 2017. A “Mercury Week” of events took place 22–29 September, under the banner “Make Mercury History” to coincide with the first meeting of the Conference of the Parties to the Minamata Convention on Mercury (COP1), convened by UN Environment. See the infographics and click here for more infor­mation. This new publication highlights the impact environmental risk factors have on NCDs. It not only presents the burden of NCDs caused by environmental risks but also emphasizes on the key areas where action is needed to reduce this burden. It provides evidence on why environmental risk reduction is essential in NCD prevention and control strategies. Following the release of Don’t pollute my future! The impact of the environment on children’s health and The public health impact of chemicals: knowns and unknowns, this publication is the third in the series. It draws on data from Preventing disease through healthy environments: a global assessment of the burden of disease from environmental risks. To access the publica­tion, click here. The fifth international lead poisoning prevention week of action focussed on efforts needed to eliminate lead paint. The Global Alliance to Eliminate Lead Paint set a target that by 2020 all countries should have legally binding controls on lead paint. However, to date only 66 countries have confirmed that they have these controls in place. A lot remains to be done to meet the set target. The lead poisoning prevention week of action took place from 22 to 28 October 2017. During the course of the week, activities around the world were organized to raise awareness about the health hazards of lead and the need for action to stop lead exposure, in­cluding regulating lead paint. WHO, with partners, is providing materials and a resource pack for campaign organizers. For further information, click here. To register your own lead poisoning prevention event, click here. Member States, experts and key stakeholders will gather to review global progress on air quality and health and agree on further action as requested in WHA 68.8. The conference will take took place October30-November 1, 2018 in WHO Headquarters, Geneva, Switzerland. For more information, please contact: ambientair@who.int. 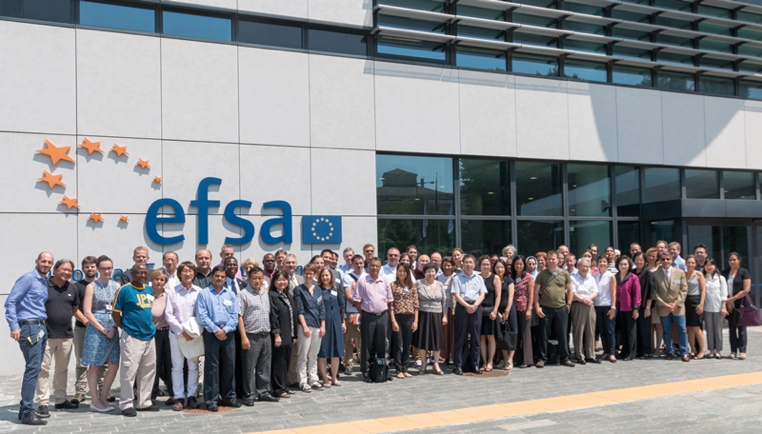 The World Health Organization Chemical Risk Assessment Network held its second meeting on 20–22 June 2017, hosted by the European Food Safety Authority (EFSA) in Parma, Italy. A total of 74 participants from 39 countries attended the meeting, which was the second opportunity for Network Participants to meet face to face (the first meeting was held in Paris in 2014). The meeting featured a mixture of keynote lectures, presentations about ongoing Network activities and group discussions to plan future Network activities. The development of a capacity building strategy for the Network was a major focus of the meeting, and other themes addressed included combined exposures to multiple chemicals, human biomonitoring and new scientific approaches for regulatory safety assessment. The meeting also featured the launch of a new WHO publication titled “Chemical Mixtures in Source Water and Drinking-Water” which provides an overview of available tools and practical recommendations to support the assessment and management of risks to human health associated with chemical mixtures in drinking-water and its sources. The meeting supported the continuation of several ongoing Network activities and also supported proposals for a number of new project ideas, for example in the areas of prioritization of chemicals and settings of concern for risk assessment and identifying new and emerging risks from chemicals. The outcomes will be summarized in a meeting report available on the WHO web site, and the Network plans to meet again in two–three years. Additional events were also organized back-to-back with the Network Meeting. 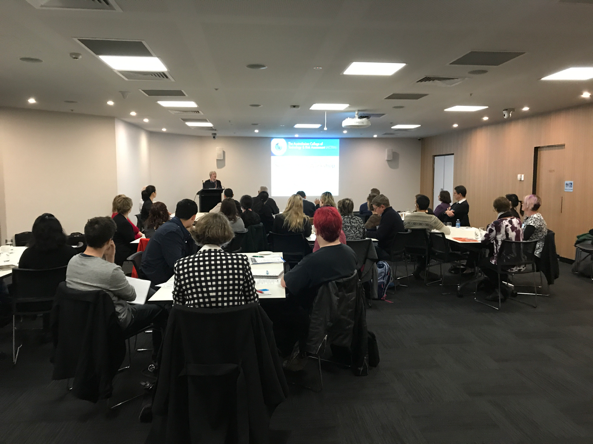 There were two training events covering “Systematic review in chemical risk assessment” and “Setting health-based guidance values”. A meeting to identify opportunities, obstacles and challenges to involvement of institutions from developing countries in the Network was also convened. The 61 chemical risk assessment institutions represented at the meeting included a representative from IUTOX which is a Participant in the Network. Further information about the Network can be found at www.who.int/ipcs/network. 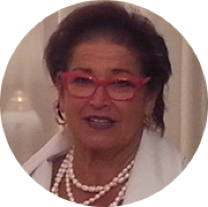 Emanuela Corsini represented IUTOX at the event. Early Career Scientists Gathered in Uganda this August as Part of the 5-Year “Leading Integrated Research for Agenda 2030 in Africa” Program. Following a call for proposals on 'Advancing the implementation of SDG 11 in cities in Africa,' 31 representatives of successful pre-proposals attended a 5-day training workshop on trans-disciplinary (TD) research. This Year’s High Level Political Forum at the United Nations Met from 10–19 July. The ICSU Regional Office for Latin America and the Caribbean (ROLAC) is pleased to circulate INGSA's Call for Grant Opportunities for Science Advice Projects in the Global South. The International Network for Government Science Advice (INGSA) is a collaborative platform for policy makers, practitioners, national academies, and academics to share experience, build capacity and develop theoretical and practical approaches to the use of scientific evidence in informing policy at all levels of government. Applications are now open for the new INGSA Research Associate Grant Program. These grants are offering the opportunity for researchers and policy professionals to undertake projects investigating the role of science evidence and advice in achieving the UN’s Sustainable Development Goals. Six recipients will be awarded from countries in the Global South (check the list of eligible countries in the links below), and provided with up to €15,000 each to complete their project. See INGSA Grants—Call for Applications.pdf and INGSA Research Associate Grant T&Cs.pdf for eligibility criteria and application requirements. There is also an INGSA Guide for Hosting Institutions.pdf document, detailing financial reporting requirements, etc. Scholars at Risk has released Free to Think 2017, an annual report analyzing 257 reported attacks on higher education communities in 35 countries, from September 1, 2016, to August 31, 2017. Read more. The Need to Accelerate Therapeutic Development: Must Randomized Controlled Trials Give Way? Hear from two Junior Academy Members about the experience of working together on to solve one of our recent challenges. Activating the Network, One Member at a Time: Learn how Member-to-Member Mentoring helps young scientists tap into the power of the World’s Smartest Network. A new TWAS-Elsevier Foundation award honors researchers from Cameroon, Ethiopia, Kenya and Nigeria—all of them advancing sustainability science in their home countries. One winning researcher has been successfully testing a new fishing technology that improves the fishing trade for Kenyan citizens. Read more. Science for Peace: IAP and TWAS will be leading key sessions at the forthcoming World Science Forum in Jordan from 7–11 November. Each year, the World Economic Forum honours 50 extraordinary scientists under the age of 40 for their contributions to advancing the frontiers of science, engineering and technology. They are selected from all regions of the world and from a wide range of disciplines to join the Young Scientists community and benefit from a tailored programme that exposes them to policy and science leaders, decision-makers and entrepreneurs, and explores topics such as career development, mentoring, ethics, science communication etc. The World Economic Forum offers the Young Scientists continuous support through its academic and expert networks as well as engagement opportunities with its initiatives, while also supporting the community’s own projects. As part of this experience, Young Scientists are also invited to participate alongside business and political leaders in the Annual Meeting of the New Champions in China, at the end of June (dates to be confirmed). The event gathers more than 2,000 industry leaders, chief executives of top-ranked multinationals, heads of state/government and ministers, as well as leaders from media, academia and civil society to explore the influence of technological changes on global economic, political, societal and environmental challenges. During the Meeting, Young Scientists are exposed to the World Economic Forum activities, benefit from a tailored programme, and are given the opportunity to meet with high-level policy leaders, entrepreneurs and science editors in an informal and intimate setting. The Annual Meeting of the New Champions is also an opportunity for them to raise public awareness by engaging with peers, non-scientists, as well as decision-makers. Young Scientists are provided with accommodation and local transportation, and benefit not only from a private programme specifically designed for them but also from the full public programme. If you’d like to be nominated by our organization, please send us your resume and contact information to icsu.rolac@gmail.com. Our institution will then nominate six candidates from Latin America—Three women and Three men—whose expertise, leadership and communication skills represent excellence. The Scientific Liaison Coalition (SLC) webinars and webinar series are open to scientists around the globe. Once presented live to the SLC partner societies, the webinars are posted on the SLC website. Of note is a webinar on How to Get Published in peer-reviewed publications that will be presented in February 2018. So check out the SLC website for more on this 2018 opportunity in early December. For now, a webinar series on Predicting Adverse Effects Before They Occur: Teratogens as an Example will be available for viewing in late 2017. On the behalf of the Serbian Society of Toxicology (SETOX) and the International Union of Toxicology (IUTOX) it is my pleasure to invite you to attend the 10th Congress of Toxicology in Developing Countries and 12th Serbian Congress of Toxicology to be held in April 2018, 18–21, Belgrade, Serbia. Held every three years, CTDC is organized by IUTOX and member Societies. The first CTDC congress (at time not an IUTOX official meeting) was organized in Argentina by Dr. José Alberto Castro with the aim to provide a forum for discussing toxicological problems facing developing countries and exchanging knowledge with toxicologists from all over the world, especially from developing countries and regions. Other CTDCs were then organized worldwide in developing countries in Asia, South Africa and Europe. Serbian Congress of Toxicology has been held every four years since 1974 with broad program dealing with different fields of toxicology and gathering scientists from this region with other eminent international scientists. In addition to excellent scientific, we offer you attractive social program and chance to experience charming April days and exciting sights and sounds of Belgrade. With your energy and enthusiasm we will make this event a meeting to remember. Information regarding registration and hotel accommodations is now available on the Congress website. The 15th International Congress of Toxicology (ICTXV), which is taking place July 15–18, 2019, at the Hawaii Convention Center in Honolulu, Hawaii, USA, will serve as a global forum for the exchange of ideas and science that is relevant to improving human and environmental health in countries with both robust and developing research and regulatory enterprises. The ICTXV Scientific Program and Continuing Education Committees are busy creating an inclusive and diverse program and currently is accepting submissions for Symposia and Continuing Education courses that fit the meeting theme of “Toxicology Solutions for Global Public, Environmental, and Personal Health.” Co-hosts, the International Union of Toxicology (IUTOX) and the Society of Toxicology, USA (SOT) invite their sister societies and members to submit scientific sessions and continuing education courses that highlight excellence in science and the practice of toxicology around the globe. The session proposal submission deadline is December 31, 2017. Visit the ICTXV website for more information. 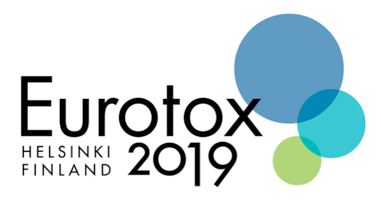 The EUROTOX 2019 Congress will be held in Helsinki, September 8–11, 2019. The congress theme is “Toxicology—Science ProvidingSolutions” and reflects our inclination to tackle topics dealing with new and emerging technologies, personalized medicine, epidemiology of exposure to chemicals, as well as environmental issues. Submissions in line with this theme are strongly encouraged. Send proposals to secretariat@eurotox.com. Make sure to follow the general guidelines and use the official template. The 49th STC Symposium will be held at the Omni Hotel in Montréal. The meeting will start with an evening reception on Nov. 29, and the scientific sessions will be held on Thurs. Nov. 30 and Fri. Dec. 1, 2017. The online program is available at the STC website. Why (we are often asked) doesn’t STC ever hold its Symposium in Toronto? It’s the biggest city in Canada, eh? “T.O.” … “Hogtown” … “The Big Smoke” … “The 6”. Well … in response to your many requests, we are going to do exactly that, in 2018! The venue will be the Courtyard by Marriott hotel, in the heart of downtown at 475 Yonge Street. We have secured an excellent room rate—details to follow.